Janine Jackson interviewed Dean Baker about taxing the rich for the February 8, 2019, episode of CounterSpin. This is a lightly edited transcript. Janine Jackson: One in three GoFundMe campaigns in this country are for medical expenses. One in five households have zero or negative wealth. Millions of people are one paycheck away from hardship. And this is the same society in which there are people who can’t remember how many houses they own, or are puzzled about why furloughed federal workers would be going to food banks. 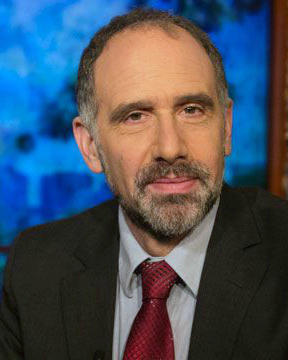 Dean Baker is co-founder and senior economist at the Center for Economic and Policy Research. He joins us now by phone from Utah. Welcome back to CounterSpin, Dean Baker. Dean Baker: Thanks a lot for having me on. JJ: Corporate media have trouble, or often don’t bother, to distinguish between ideas and those espousing them. So when Ocasio-Cortez suggests the idea of a top marginal tax rate of 70 percent, that gets sucked into the vortex of her coverage—you know, coverage of her—as with wealth tax proposals from senators Elizabeth Warren and Bernie Sanders. Before we talk about the limits of those ideas, I wonder if you could just talk a bit about both top marginal tax rates and increased taxes on extreme wealth, given that media often present those ideas as kind of ideas from Mars, or proof that these politicians are wild-eyed fantasists. DB: Yeah, well, the reaction to both proposals has been fascinating. Both the public reaction, where there’s clearly been a lot of support—people are saying, “Yeah, you have a lot of real rich people, why shouldn’t they pay more in taxes?”—but more so from the media and from some establishment politicians. So the reaction is, “Oh, here’s flaky Alexandria Ocasio-Cortez, where’s she get off, 70 percent?” And, in fact, that’s a number that many of the world’s most prominent tax economists have said, “This is the maximum tax rate,” in the sense of maximum amount of revenue. And there was a widely read article by Peter Diamond, who’s a professor at MIT, and Emmanuel Saez at Berkeley, both very, very prominent. Diamond won the Nobel Prize, Saez the John Bates Clark award, two of the most prestigious awards you can get in the profession, so these are people in very high standing. And they came up with that number; there are all sorts qualifications and reservations, but in any case, they didn’t think it was ridiculous. So when you have a new member of Congress propose that, well, the media jumped on that like, “Oh, she’s just being flaky.” And, in fact, it’s a very reasonable thing to put on the table; whether that’s the right rate, of course you could debate that. 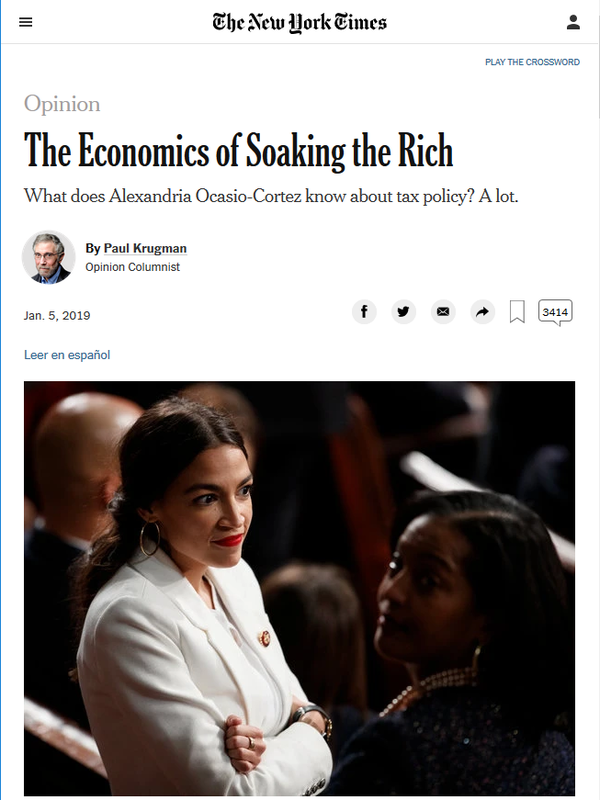 But it certainly was not a ridiculous proposal, and again, Paul Krugman had a very nice piece, where he’s contrasting that with the Republican proposals to cut taxes on the rich, where they were saying that they would pay for themselves, which was ridiculous. But that was treated like these are serious people. So it’s been fascinating that there’s been such a rush to dismiss these kind of far-out proposals by radical leftists, when they’re reasonable proposals—which, again, is not to say that they’re necessarily the best policy, but they’re certainly reasonable proposals to put on the table, and to be debated. JJ: We read that Michael Dell—who has $30 billion or so—at the World Economic Forum, apparently said, “Name a country where that’s worked—ever.” The 70 percent top marginal rate. Missing something, you could say. DB: Yeah, of course, one of the co-panelists said, “The United States,” because that was in fact the rate in the United States, until Ronald Reagan lowered it with his tax cuts in 1981. And if we go back a little further, it was 90 percent in the Eisenhower days; Kennedy had lowered it to 70 percent. So, again, one could argue whether these are the best rates. But to treat this as a crazy idea out of far left field is just wrong. And some of the back and forth—because I was on Twitter with Dell, and there were others involved, obviously—and what I find most striking, Dell’s kind of a poster child here, because what is Dell’s expertise in this area? He’s very rich, no doubt about that, but he obviously knows nothing about tax rates. I mean, again, we could disagree, is 70 percent the right rate, but to act like that’s just impossible, we’re going to see our economy collapse—that’s nuts. He knows nothing about it; he just has $30 billion, so therefore he thinks he’s qualified to talk about it. JJ: It’s good, I think, that we’re talking about taxing extremely high incomes and wealth—for all kinds of reasons. The LA Times’ Michael Hiltzik was saying, it helps move us away from this notion that wealth is “self-made,” that these folks owe nothing to society, and it disrupts the fallacy of trickle-down. You suggest, in this recent piece for Truthout, that while that is not wrong, it’s not getting to the crux, the bigger source, of the rise in inequality. DB: Yeah. So the point I made in that piece—and, really, I’ve made it in much of my writings over the last 10 or 15 years—is that the distribution of income is not something that just happens. It depends on how we structure the economy. And I would say the economy is pretty much infinitely malleable. We could structure it all sorts of different ways. And my favorite example here—just because it’s so blatant—is I like to say, “How rich would Bill Gates be if he didn’t have copyright or patent monopolies on Windows software?” If anyone in the world could just start mass-producing computers, and copy in Windows and all the other Microsoft software, and they don’t even have to send them a thank-you note? Well, needless to say, he would not be one of the richest people in the world. He wouldn’t have $100 billion. I’m sure he’d do fine. But the fact that someone like Bill Gates could become incredibly wealthy was because of how we designed that market. And it’s pretty much the same story everywhere you look. Finance: Where would all these Goldman Sachs guys be if we didn’t have the bailout in ’08 and we just let the market run its course? There’s many other ways we subsidize finance as well. Corporate CEOs: They were always well-paid, but if you go back to the pay standards of the ’60s and ’70s, they’d be getting $2 or $3 million a year, not $30 and $40 million. So we structure rules that allow people to get incredibly wealthy. And I really prefer that to be the focus, both because as a practical matter, it’s much harder to get the money back once they have it. I mean, there’s all sorts of practical issues that people rightly raise. Sen. Elizabeth Warren says, “Let’s tax the wealthy.” Well, they’re not just gonna hand it over to you. It’s going to be hard to do, which isn’t to say it’s not something we might want to do, but it’s going to be hard. And secondly, the political issue. If we act as though, “Well, you know, Bill Gates got that fair and square,” we shouldn’t take any of it back. If you go, “Well, we could have structured it differently, and then Bill Gates wouldn’t have it,” and then we don’t even have to have this discussion. JJ: I wonder, do you think it’s a trap to talk about these things in terms of revenue, in terms of how much money it would bring to the economy? I read a piece by Vanessa Williamson from Brookings, where she said that taxes on the very wealthy “should be judged by their societal impact and not simply by their revenues,” that it has to do with the fact that just having some people be so wildly wealthy is “incompatible with democracy.” And so we shouldn’t get too hung up on how much money it would give to the economy to institute some of these changes. What do you make of that? DB: I think it’s a very important point, and I remember some years ago, there was a piece on the estate tax that was done by Alicia Munnell, now at Boston College, and she came up with some figure that we get a relatively small amount of revenue from the estate tax. I’m saying relatively small, still substantial, but much less than if you just said, “Oh, here’s how many rich people died, and we tax it a 40 percent rate”—we get a very small amount relative to that. 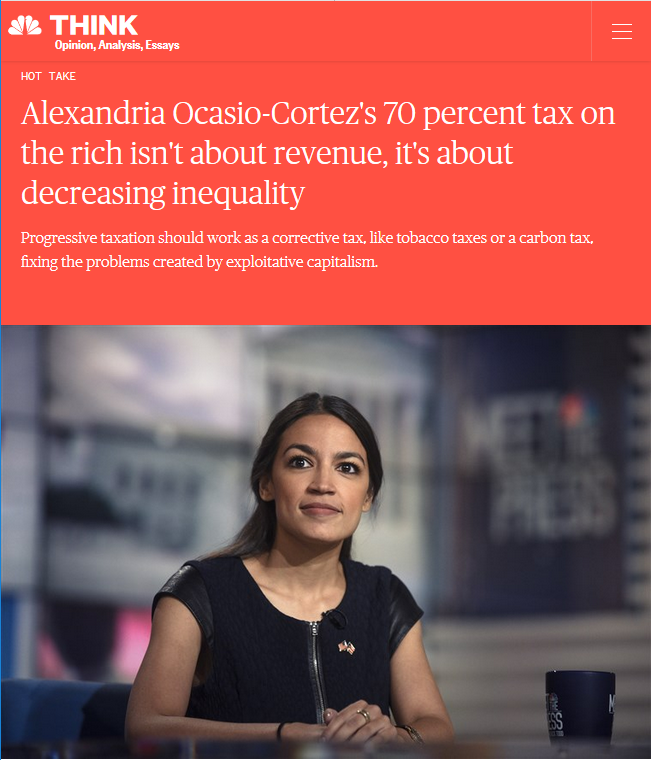 But she wasn’t writing as a critic of the tax, because of the two points she was making, one is exactly this one: That part of the story is, we don’t want massive amounts of wealth to be handed down, so you get Donald Trump or his kid walking away with billions, and suddenly having all this political influence. But the other is, part of what they do to avoid the taxes is do things like start foundations, like the Ford Foundation and the Gates Foundation. Now, those aren’t my dreams; I mean, there’s a lot of bad things I could say about the way those foundations are run. But the point is, that’s not altogether a loss for society, because they do do some good things. So to act like, “Oh, they aren’t going to pay the tax. They’re just going to start a foundation that provides inoculations to children in Africa.” Well, that’s not a bad thing. So to just look at it and say, “OK, how much revenue are we getting from the tax,” that is missing the point. My wife and I set up a foundation…and we would have contributed quite a bit more than a 70 percent tax rate on my annual income. And I feel much more comfortable with our ability as a private donation to allocate those funds than I do giving them to the government. DB: Well, I guess we’d have to talk to Michael Dell. He still could do that. JJ: Exactly. But I think what people are saying is, the problem isn’t whether that’s true in real numbers; the problem is running a society on noblesse oblige. DB: Yes, you know, we don’t want to have to depend on—you know, I wasn’t going to go into my criticisms of the Gates Foundation and the others, but yeah, we don’t want to depend on their goodwill. I mean, people need healthcare, they need education, all the other necessities of life. And it shouldn’t depend on whether Michael Dell, he and his wife, are good people, and they’re going to contribute to that. I mean, it’s nice if they want to, but that shouldn’t be what we depend on. JJ: Well, a poll from that pinko rag Business Insider showed that Ocasio-Cortez’s proposal, the 70 percent top marginal tax rate, was more popular than the GOP tax cuts, which you alluded to before. People don’t even think that “socialism” is a curse word anymore, which removes a real arrow from some folks’ quiver. But I think we want to say that none of these proposals, working on pre-tax income, post-tax income, they’re not opponents of one another as proposals, right? And other things, like raising the minimum wage, could fit in there, too. I guess it just does seem like more ideas are on the table than we’ve grown accustomed to, and I wonder how we keep that window open, and how we keep pushing for more? DB: It has been great that you have people put it on the table, and there’s been a good popular response. And I have to say it, to some extent our best allies in this have been the Republicans and conservatives, because they’ve said things that are just so absurd. Of course, it has nothing to do with her proposal. She’s talking about people who get over $10 million. So over $10 million. And I don’t know whether Scott Walker literally doesn’t understand a marginal tax rate, or he’s just being dishonest about it. But he publicized this, and needless to say he got raked over the coals for it. My guess is he won’t do that again. But it has certainly pushed the window on how we could talk about these things. So in that sense, we don’t all have to agree that A, B or C is the best or, you know, what I would say is, we probably want a mix of A, B and C.
But in any case, it certainly expanded the window of discussion in a really positive way. DB: Thanks a lot, Janine; good to be on again.